Over the past few years of trying to run a profitable social enterprise that is meaningfully connected to my local church there have been a number of revelations. Most of them have had to do with various aspects or growing awarenesses of how isolated I have been in my church role from the community at large. For those of us that have read books on missional theology, this is nothing new. It was only a revelation to me in the sense that I thought I had cleared the church/community wall a number of times in my ministry. But, engaging a model of social enterprise that truly interests the community has resulted in a volume of extra-ecclesial connections that I had never thought possible. I have met with superintendents, church folks, community service providers, and business people and the web of connections in my community to good work has formed at an unexpected pace. Over the course of this season I have begun to construct an economic model (a very humble one!) that describes the degree to which I think the church has been isolated economically. I call it the 4 Rings of Kingdom Economics. The basic idea is that if we truly believe that whatever we are working on is good Kingdom work, we need to find better ways to fund it. I believe that in my life time the people of God are going to need creative ways to find resources to live out the hope that they have. If we want to bless the world, we will need new economic engines to do so. The model I created simply articulates where I think we are and where we need to broaden our economic thinking. This ring represents the majority of Christian history. I don't think I need to explain Christendom to you all. This ring represents the church's most isolated thinking. Basically the church is/has been funded off of the benevolences of the christian empire and people's private morality for the better part of 1700 years. However, this ring has begun to shrink. The church has lost its privileged status in a few respects and its influence is declining rapidly. My suspicion is that this trend will only increase (and I happen to think it is a good thing in some respects!). In my mind this is a ring that reeks of dependency and apathy. It causes the church to be safe, isolated, and frumpy. It also incentivizes the church to engage in charitable work that does not actually cause real uplift, but rather robs people of their dignity and tends to maintain the status quo. We have a veneer of balm, that never really engages the roots of the justice issues we are trying to resolve. It looks like we care, but only to a point do we really want to help others. Why risk a steady flow of capital when you have plenty to take care of your baseline? This ring represents other individual charitable resources. Many people in Christian communities give very little of their actual wealth to what they at least say is the most important institution in their lives. I think the average is about 2.5% or something around there. I have heard many pastors lament this. "Gee, we could do so much more good if people gave more to the church!" I have always been frustrated with this sort of thinking. The problem isn't the people. It's the passion. Many people in my church have privately acknowledged as I have been engaged in this project that they give quite a bit outside the walls of the church and outside of Christianity. They will often say in a kind of half whisper that it is because they don't find what we are doing at the church to be compelling enough. They don't trust that if they gave more that it would actually be used on the right sort of work! I am not sure they are wrong. I believe that churches and ministries need to stop complaining about people's lack of giving and look at their own repetoire of missional ministries. Is there anything there that is compelling enough for someone to actually lay their life down for? If there isn't why would they bother parting with their treasure? I continue to believe that most of human beings are looking for something so worthwhile that we would trade or very lives for it! In fact, I am often shocked at what we waste laying down our time, money, and health to pursue. People "passion" for our ministries as my friend Kenda Dean might say, if we had something worth suffering for! If we can develop ministries that are actually worth people's blood, sweat, and tears then maybe they would actually lay down their lives and their dollars! In short, we don't have compelling ministries. When we begin to develop ministries that are compelling I think we will find that our people have way more human and monetary resources than we have even begun to imagine. This second ring represents their untapped heart/passion dollars. 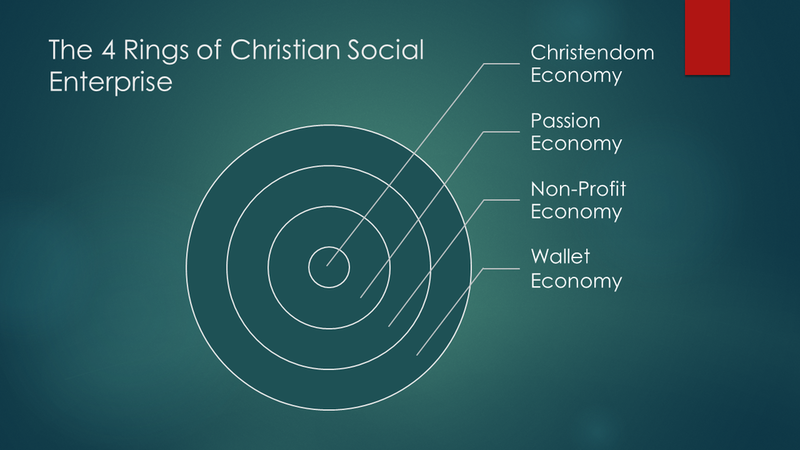 This economic ring represents funding that might come to a compelling ministry from denominational sources, granting organizations, family foundations, charitable trusts, and corporate entities that have a social mission. Many churches have never considered these as viable ways to fund the good work that they might be doing. The difficulty is of course that many of these potential sources do not care to fund a local congregation specifically. However, by setting up a 501c3 (relatively easy these days) with its own board and mission, one can clear that hurdle. There are billions of dollars available for organizations that are well organized and have a clear sense of what the mission is that God is calling them to engage. This ring represent the multi-trillion dollar economy that is ebbing and flowing every day in our world. This ring is one that Kingdom based enterprises can engage with regardless of whether or not our world/customers share our faith or justice goals. There are many people who don't care about faith, but who do care about the poor and just want a good cup of coffee. They might want fair trade clothing. They might want their lawn mowed by an ethical company that is teaching teens how to work. What is great is that by accessing this ring of the economy, ministries can use the normal to create to accomplish the hopeful. We are simply tapping into the day to day purchases of ordinary folks in order to accomplish Kingdom good. In many ways this source of funding Kingdom work is limitless! Think how many dollars change hands in our economy every day. However, this ring also will require excellence because to exist in this ring will require a level of efficiency and competetiveness that is high. It will also require the providing of goods and services that are top notch. The marketplace just won't tolerate mediocrity for very long as a general matter. This represents a challenge because in many ways the church is known for mediocre. No one goes to a church supper expecting excellent food. In the confines of the 1st ring mediocrity works and is even expected. People actually might get kind of irritated if the fare was superb at church meal. They would wonder how much we spent and why!? But, when you step into the every day economy people want bang for their buck. They have much higher expectations because they are not giving to you out of benevolence. So while this ring has access to trillions, it comes with a challenging set of competitive costs. Note: I am still refining this model and what it means. I would welcome some comments from folks to help me reflect and revise it. I would also love to know how it strikes you theologically and intellectually. What questions does it bring up and what challenges? Do I have some presuppositions that I am blind to? Let me know.